Like most contemporary PGA Tour players, Jason Day uses his tournament statistics to help structure his practice routine. The 27-year-old Australian knows, for example, that in 2014, despite his win at the WGC-Accenture Match Play and five other top 10s, he was ranked 131st on tour in driving accuracy. So he will pay particular attention to the driver in his sessions with his coach and caddie, Colin Swatton. TIP FOR THE TEACHERS: While your students don’t have access to the immense archive of stats PGA Tour players have at their fingertips, encourage them to track things like fairways hit, greens in regulation and putts during their normal rounds. This will help you focus on weak areas of their game during lessons. From there, Day increases his ball count. “The only way to get better is more volume and quantity of balls that you’re hitting,” says Day. Day, who turned pro in 2006, follows a set practice routine on weeks when he’s not in competition. He splits his six-hour practice days almost equally between putting, short game and hitting. He tries to hit between 150 to 200 balls—going through a deliberate pre-shot routine, where he tries to visualize each shot. He doesn’t address the ball until he can picture the ball flight clearly in his head. The consistency of his pre-shot routine is one of the bulwarks of his strong mental approach to the game: a habit ingrained into his psyche from doing it over and over again in practice. 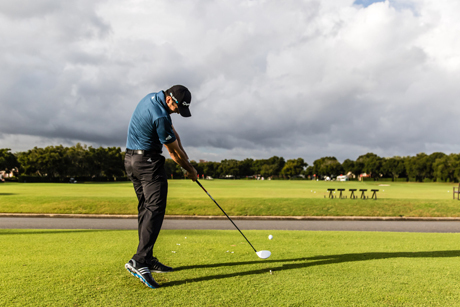 TIP FOR THE TEACHERS: Encourage your students to incorporate their pre-shot routine into practice sessions – going through the motions before each swing, rather than just firing range balls like a machine gun. At tournaments, Day arrives at the course two and half hours before his tee time. After stretching with his trainer for about a half hour, he spends thirty minutes hitting balls and another 10 to 20 minutes putting and chipping. “I’m just trying to get a feel for the sand and the grass and how fast the greens are rolling,” he says. He never puts too much stock into how he’s hitting the ball in these warmups. For players of all skill levels, the quality of their range session before a round can be a good indicator of things to come on the course. But for Day it’s a much more complicated affair. “It’s not so much the hitting, it’s how the body feels,” he said. “For me it’s more about how the body is moving than it is about where the ball is going or how solid I’m hitting it. TIP FOR THE TEACHERS: Remind your students how important it is to warm up prior to a round. But, how they hit the ball during this pre-round session is not important – it’s more about preparing the body and engaging the golf muscles. After battling a bad back and thumb injury for most of 2014, Day has big goals for 2015. He’s hoping that he’ll be pain free in the upcoming year to practice hard enough to get to No. 1 in the world and win his first major championship. He knows that his journey to the very top of the game begins on the practice tee.